The Song Factory is a one-stop resource for anyone interested in the craft of songwriting — whether you’re just starting out or have been writing and performing songs for many years. I’ve been writing and performing my songs since ’90 and have just released my 20th album, The Story Teller’s Suitcase. I’m also passionate about the songwriting craft and have mentored and taught hundreds of songwriters over the years. My teaching materials and posters on Performance, Song Creation, and Song Editing are referenced daily in the writing rooms of over a thousand accomplished songwriters all over the globe. 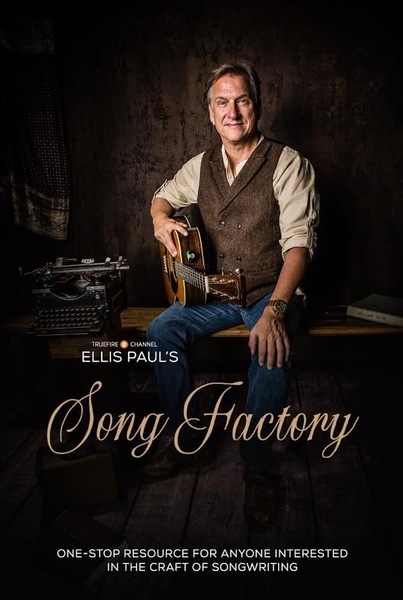 I’ll share writing exercises, creative insights, song form and structure lessons, anatomies of my own songs, and even discussions on the business of music here in the Song Factory — all designed to inspire your songs, improve your lyrics, stimulate your content and ideas, and more broadly, get the beating heart of your creative life pumping! There’s plenty of free content but a Premium Subscription will give you unlimited access to ALL of the content, across ALL of the sections in the Song Factory. Premium Subscribers can also participate in the writing exercises, creative song prompts, monthly class presentations, and will be able to share their own work, their own songs, and their own writing for member feedback in The Song Circle Serenade. I’ll be adding new content frequently and subscribers will have access to it all — lessons, toolkits, special classes, interviews, my own performances, and performances by visiting artists and business pros on the subject of songwriting and the business of music. The Premium Subscription + 1 Private Lesson option gives you access to everything on the channel, plus one private video lesson interaction with me every month. This is a perfect option for songwriters seeking immediate feedback on single songs, or those who might be struggling with a specific issue that needs some insight or direction; a melody change in the chorus, does the song need a bridge, or suggestions on lyric choices, chord changes, or the general direction of the song. The Premium Subscription + Ongoing Lessons option gives you access to everything in the channel, plus ongoing private lessons and interactions with me. This option allows us to engage in a continuing conversation about a single song or issue until it finds it’s home on a recording or on the stage. A perfect option for anyone who wants to edit and process a single piece of music or work through a collection of songs one by one over time, with an eye towards recording an album or preparing a set’s worth of original material. Whichever option you choose to work with me, I very much look forward to the opportunity to get to know you and your work better. Let’s write songs!